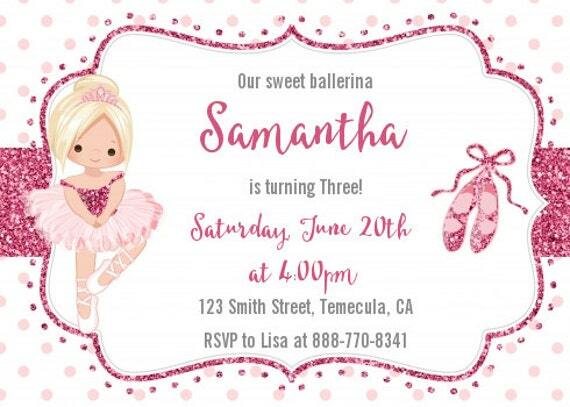 Make your birthday party perfect with our Ballerina Birthday Party Invitation. We added just the right amount of pink sparkle to give your ballerina her dream birthday party. 3. You have three choices of hair color for your little ballerina. 4. Is a 5x7 Printed Birthday Party Invitation. Your customized invite will be shipped to you within Two (2) business days. 4) We will email you a proof within 24hrs to the Etsy email address you have on file. 4)Your customized invite will be shipped to you within Two (2) business days. The shipping charges in the listings are for Priority Mail USPS with tracking and delivery confirmation. Delivery ranges from 2-4 days. If you need to "shave off a few days" please send me a message and I can upgrade your order to express mail for a nominal fee. This item is for personal use only. Candles and Favors retain all rights. This item may not be copied, shared, forwarded, sold or distributed. Copyright Candles and Favors, Inc.